Which is the best alignment for the North West Rail Link? 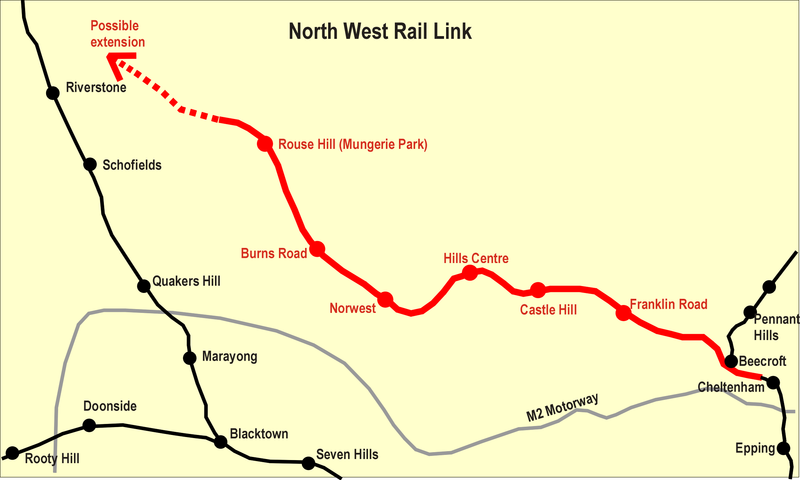 Three different alignments have been proposed for the Northwest Rail Link (NWRL) over the years: via Strathfield, via Chatswood, and via Parramatta. The first (via Strathfield) involved the line from Castle Hill linking up with the Northern Line around Cheltenham on the surface, allowing trains to travel into the CBD either via Strathfield or Chatswood. This was abandoned due to the requirement that the line be quadruplicating between Epping and Cheltenham in order to prevent that portion of dual track from becoming a bottleneck. Local opposition and a cost so high that tunnelling was a cheaper option led to this alignment being abandoned in favour of the second option. The second (via Chatswood) is the currently planned alignment. It involves connecting the rail tunnels directly to the underground station at Epping, which means all NWRL trains must continue on to Chatswood and cannot divert to Strathfield. This reduces flexibility, but Cityrail’s Clearways program of sectorising the rail network into independent lines meant that flexibility wasn’t something Cityrail was looking for anyway. The third (via Parramatta) was floated by Parramatta Council as a way of getting the Parramatta to Epping Rail Link (PERL) built. It involved building the NWRL through to Castle Hill, then sending it South to Parramatta, before going to Epping and continuing through to Chatswood and then St Leonards (avoiding the need for an expensive Second Harbour Crossing). Passengers heading into the CBD could change at Parramatta for express services. However, it also meant a longer trip for anyone heading to Macquarie Park or the North Shore. All three options see capacity constraints for CBD trips: with the Western, Northern, and North Shore Lines all highly congested and near capacity. Where do people from The Hills want to go? The locations that Hills residents desire to travel to is ultimately what should determine which of the 3 options should be taken. For the purpose of determining this, work commutes will be taken into account (as data is most easily available for these, though the most recent data I was able to obtain was from 2001). I’ll be using Bus Contract Region 4 (see map below) as a proxy for The Hills, however this also includes areas further South such as Westmead, Northmead, Carlingford, etc. Calculations are included at the end. Most Hills residents (57% ) work outside of large centres. The widespread nature of where their work is located means that public transport is unlikely to compete with the private vehicle for their work commutes. Nor should it, as these are the sorts of trips which require the flexibility of a car, rather than the capacity of public transport. The remaining 43% work in large centres [A], primarily in Parramatta/Westmead – 9.9% [A], the Global Economic Arc (Macquarie Park, Chatswood, St Leonards/Crows Nest, and North Sydney) – 7.7% [B], the Sydney CBD – 7.3% , Castle Hill – 4.7% [A], and various other centres – 12.6% . These are respectively shown in green, blue, yellow, grey, and brown in the chart below. Given the southern half of Region 4 includes suburbs between Parramatta and The Hills, which are likely to over represent the number of people who work in Parramatta/Westmead, the proportion of Hills residents who work in Parramatta/Westmead is likely to be less than 9.9%. That would make each of the 3 major employment zones (Parramatta/Westmead, the Global Economic Arc, and the Sydney CBD) are roughly equal in size, with Castle Hill close behind them. All three options have the same alignment up to Castle Hill, at which point they begin to diverge. So it is the other 3 employment zones which differentiate the alignments. The via Parramatta alignment is the only one that provides access to Parramatta/Westmead (the latter via a change of train at Parramatta). It also provides access to both the CBD (with a change of train at Parramatta) and the Global Economic Arc (by continuing on via the Parramatta to Epping Line). However, the former is capacity constrained and the latter would be delayed by having to travel to Parramatta before continuing to Epping. The via Strathfield alignment gives no access to Parramatta/Westmead. By allowing some trains to go to the CBD via Strathfield and some via Chatswood, capacity constraints are limited. However, it also limits access to the Global Economic Arc. Eventually, construction of a Second Harbour Crossing can allow all trains to travel via Chatswood, providing good access to both the CBD and Global Economic Arc. The via Chatswood alignment gives no access to Parramatta/Westmead. It gives the best access to the Global Economic Arc, initially with direct trains to Macquarie Park and Chatswood, but easily extended to St Leonards by quadruplicating the track between Chatswood and St Leonards. Eventually, construction of a Second Harbour Crossing can allow all trains to travel directly to the CBD, providing good access to both the CBD as well as the Global Economic Arc. The via Parramatta option provides benefits if a Second Harbour Crossing does not happen, and is partly designed to defer the need for one. It also highlights why the government has committed to a Second Harbour Crossing – it unlocks much of the potential of the NWRL. This makes the via Parramatta option a viable one, but also one that suffers from short sighted vision, as a Second Harbour Crossing will eventually be needed, but will be less useful if there is no NWRL for it to connect to. The via Strathfield and via Chatswood options seem roughly neck and neck, especially considering either can be upgraded with a Second Harbour Crossing to run trains directly to the CBD via Chatswood, providing good connections to both the Global Economic Arc and CBD. But there are 2 things that make the via Chatswood option superior. First, it avoids the problems of building the surface route between Epping and Cheltenham to avoid capacity constraints on that portion of track – including high cost of land acquisition, delays due to the need to start planning again from scratch on that portion of the line, and strong local opposition. Second, it goes against the concept of sectorisation, mixing different trains on the same lines – in particular this would prevent an effective private sector operation of the new line and the associated cost benefits that could come from it. Each alignment has advantages and disadvantages, and there is no clear superior option. However, the NWRL via Chatswood alignment does appear to have a slight edge over the other options, on the assumption that a Second Harbour Crossing is built right after the NWRL is completed (as is current government policy). However, this does not increase capacity on between the Hills to Parramatta, so improvements here should also be considered, particularly on the key Windsor Rd and Old Windsor Rd corridors. The former has a proposal for light rail linking Parramatta to Castle Hill currently undergoing a feasibility study, while the latter already has a T-Way where increased bus frequencies would easily achieve improved mobility. Not sure I agree with your conclusion here, but first a nit pick: the Beecroft alignment only reduces capacity constraints, and then only possibly. Really, the Northern Line could still swing if the ECRL remained usable by Railcorp, and even with the plan that it won’t, sending the trains via Strathfield is probably about right. As for your conclusion, more people from the Baulkham Hills LGA work in Parramatta than the Sydney CBD slightly. I’d be inclined to favour these people more as they are travelling a shorter distance to work anyway. That would help to develop jobs in Parramatta. Not sure how many Macquarie Park workers you would get on the train, it doesn’t seem that many of them use the bus in comparison to those travelling to CBD/North Sydney. I would guess that the availibility of parking is far higher in Macquarie Park. Final point, there was another option: the North West Metro which didn’t serve destinations on the way, but at least served an area which currently has no rail access and certainly has the patronage potential for rail. I find it hard to believe that a suface connection with the Main Northern Line between Cheltenham and Beecroft would be more expensive than a longer direct tunnel connection with the ECRL at Epping. The Main North is eventually going to be quadruplicated anyway between Epping and Hornsby (the third track from Epping to Thornleigh is already about to start construction as part of the Northern Sydney Freight Corridor) and there are alternative locations, with sufficient width in the existing rail corridor, for constructing a dive to the North West Rail Link than that previously proposed that will not foster as much local opposition. Let’s face it, if you choose to live near a railway line, regardless of the number of tracks, you shouldn’t whinge about the noise. NIMBYism is stifling infrastructure development in this city. I can’t see that there would be any compromising of sectorisation if trains from the North West Rail Link were to travel to the Sydney CBD by both Chatswood and Strathfield as both lines from Epping are classified as the “Northern Line” and are complementary to each other. It is interesting to note that the previous Labor Government made a submission to Infrastructure Australia in August 2010 seeking funding for the North West Rail Link and raising the prospect of reinstating the original proposal for the direct connection to the Northern Line because of the limited number of train paths available on the North Shore Line to the CBD in the absence of a second harbour crossing. 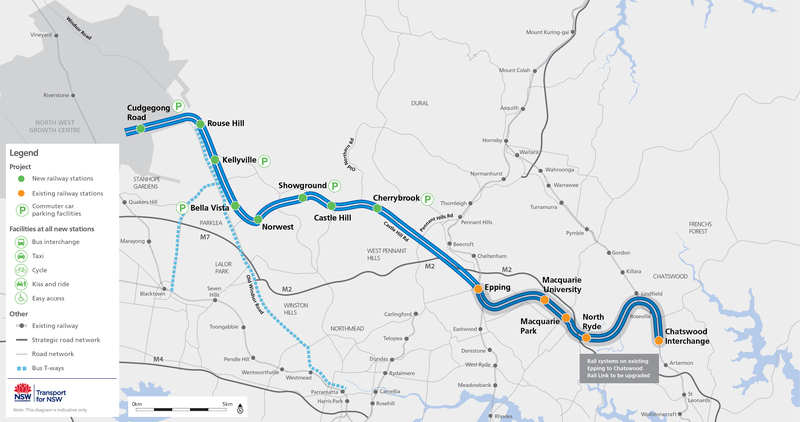 The new government, strangely ignored this possibility in its subsequent submission to reallocate the funding promised for the Parramatta to Epping Rail Link to the North West Rail Link, instead reverting to the direct tunnel link to Epping. It’s little wonder that Infrastructure Australia queried the feasibility of the Liberal Government’s proposed concept, aside from the lack of a robust financial evaluation, and they have no one but themselves to blame for their failure to secure any support. Instead, like a petulant child, they chose to ignore Infrastructure Australia’s willingness to discuss the shortcomings in their submission and resorted to Plan B which is now the Rapid Transit shuttle from Rouse Hill to Chatswood and conversion of the ECRL to single deck operation (or was this their plan all along). Even if the North West Rail Link was to proceed via a direct tunnel link with the ECRL and integrated into the CityRail system, it could still work without a second harbour crossing in the short term, but it would involve some compromises for other services on the network. But what would you expect when you are trying to shoehorn a new rail line into an already congested network. The new Rapid Transit concept would obviously preclude the operation of Northern Line CityRail trains from Hornsby via the ECRL to the CBD and they would have to revert to their previous operating pattern to the CBD via Strathfield. That frees up 4 train paths per hour in the peak for North West services to Chatswood and the CBD. These train paths would also be available for the North West Rail Link if operated as part of the CityRail network. With 2 additional train paths per hour currently available on the North Shore Line from Chatswood to the CBD, this would make a total of 6 train paths per hour. This could be increased to 8 trains per hour if either 2 of the services per hour from Gordon were reallocated to the North West Rail Link or 2 of the Central Coast Intercity services were diverted to the Main North via Strathfield. For the Main Northern Line, because of the lack of additional train paths available on the Suburban tracks from Strathfield to Central, the current Epping to Central services via Strathfield would have to be diverted to the Main Line tracks, where there is spare capacity, to terminate at Central. The services from Hornsby would then take over the vacated paths on the Suburban tracks. All Northern Line stations from Hornsby would still have a minimum service of 4 trains per hour into the CBD and on to the North Shore and in addition there would be a doubling of existing peak hour services, where there is serious overcrowding, to 8 trains per hour from Epping to Central. Whilst this is not an ideal scenario, there are a significant number of commuters who do not travel beyond Central, or who may choose to interchange anyway, and over time commuters would adjust their travel habits to which service best suits them. At least it would give some breathing space to allow for the integration of the North West Rail Link with the existing CityRail network until a new CBD Rail Link and second harbour crossing is built. I think you are reading the 43% wrongly. 19% (CBD) + 16% (Parramatta) + 11% (Castle Hill) + 7% (Westmead) = 43%. I’m not sure that there are any stats for how many jobs there are in Macquarie Park that are walkable from the 3 train stations, and especially not for how many of those are held by people in the NW (region 4). Walkability for Macquarie Park would be interesting to see. Keep in mind that the 2 main stations are a bit over 1km apart, which is ordinarily a reasonable distance to maximise the walking catchment. In fact, most of the business park is within an 800m radius of these 2 stations. Ooh, so it does. Sorry about that. It would certainly be interesting if they included where the remaining 47% is from. I don’t think walking is going to happen until the land becomes so valuable that they build over the carparks. People’s tolerance for tedious traffic jams when they could be consuming entertainment on their iDevices never ceases to amaze. North Ryde station has a cemetery nearby and they tend to consume a lot of land. Why is Parramatta looking at building a light rail to Castle Hill – wouldn’t that be a double up for the NWRL?? I am all for transport out to the NW but not at the expense of people on the Main Northern Line who will have to change trains 4 x at least with Epping station a nightmare to access esp if elderly or you have children. I believe it is a way to force people from Normanhurst to Cheltenham onto toll roads by making a perfectly good rail system which worked for 100 years a joke. The NWRL links Castle Hill to Epping. The proposed light rail line would link Castle Hill to Parramatta. They are 2 separate corridors, there is no doubling up. This highlights a lot of the nonsense that people go on with when considering these alternatives. For example, you claim TWICE that the cost of laying quadruple tracks between Epping and Cheltenham is “prohibitive”. Oh boo effing hoo ! Adding two tracks for a kilometre on an existing alignment is sooo frickin expensive ( about $30 million ), compared to 20 km or so of tunnels (about 30 billion ) ! If this were true, then how is the freight line from Epping to Thornleigh current about to be built, in any way a reasonable viable proposition ? Have you actually been to Epping and Cheltenham ? Ten men with a bulldozer could build the line there in three months if they pulled their fingers out. In the long run, the NWRL-to-Chatswood plan, will ultimately require a new line from Chatswood to the CBD. Even the Government claims this, although they think they will built it in 30 years. Apparently a new tunnel from Chatswood to the CBD is possible, but if you suggest extending the 6-track from Homebush to Harris Park and implementing a true express 15 minute service between Parramatta and downtown — oooo it’s too difficult, the cost of rebuilding the Bold St bridge ( again ) is “prohibitive”. A proper express service between Parramatta and the CBD would benefit all of the people in the west. The original plan to quadruplicate the track between Epping and Beecroft was abandoned in 2007. It was documented in a report called Network Connection Options Assessment, released in May 2007, and no longer appears to be available. As I understand it, one of the reasons why a tunnel from Epping was favoured was that it was cheaper than the surface option (it also faced opposition from local residents, as the freight line is facing now). As the report is no longer available, I can’t give specifics other than to speculate (and would also be speculating as to why the freight line is being built). But I’d imagine it is similar to the recent situation with the M4 East, where a tunnel turned out to be cheaper than the slot proposal. Sorry Bambul, I agree with Mich. As someone who lives in the area and has an intimate knowledge of how the North West Rail Link in all its guises has evolved, it is laughable that the tunnel option direct to Epping would be any cheaper than the surface connection via quadruplication from Epping to Cheltenham/Beecroft. I suggest that the cost of the tunnel option would be way in excess of a surface connection despite what the Network Connection Options Assessment may have said. If you had actually inspected the corridor for the surface connection between Epping and Beecroft, as I have, you would see that the existing rail reservation is sufficiently wide enough to easily accommodate an additional 2 tracks as well as a dive to a much shorter tunnel to Cherrybrook. Even allowing for bridges over the M2 Motorway and adjustments to Cheltenham Station, there is no way that this could conceivably cost anything like the tunnel option. There is no comparison with the Westconnex M4 East Motorway proposal as the “slot” option would involve considerable disruption to existing traffic flows and relocation of services in a densely populated urban environment, which is not applicable in the case of the surface connection for the North West Rail Link. The Epping to Thornleigh Third Track as part of the Northern Sydney Freight Corridor Program is wholly within the existing rail corridor and the later stages of this project, also within the existing corridor, could potentially see the full quadruplication between Epping and Hornsby anyway. It shouldn’t be overlooked that most of this cost will be funded by the Federal Government. As for the precious residents of Cheltenham and Beecroft, I have never heard so much garbage about the supposed disastrous impact on the community with both the original North West Rail Link surface option and more recently the Epping to Thornleigh Third Track. For Godsake, the railway line has been there since 1886 and even allowing for increased rail traffic, anyone who chooses to live close to it must be aware that there are noise consequences, but you have to live with it, or you move elsewhere. I’ve had a gutful of NIMBY’S. In any event, there are alternative options for surface connections north of Epping from the Northern Line to the NWRL which would not engender such vociferous opposition from the locals, but for their own ulterior motives, the rail bureaucracy chose not to pursue them. You can read into that whatever you like. That’s pretty disrespectful. The people of Cheltenham and Beecroft are entitled to make their voice heard if they are concerned about something just like you are. The railway line has been there for over 100 years and many people have paid a premium to choose to live there for a direct link and we accept the normal noise. The freight wheel squeal is horrific and you may not live in Cheltenham/Beecroft or you would not have called the residents precious for complaining – you would soon see how bad the noise is when you live there. I personally accept the need to build it though. I don’t accept the loss of a direct link, having to change at Chatswood is bad enough but at least there is a short walk involved whereas in Epping the change is horrific with the steep, numerous banks of escalators. You would soon see the issues if you actually lived here, Ray…. I don’t apologise for being critical of people and organisations who make completely unfounded criticisms based on spurious arguments. I am more than happy to acknowledge the genuine concerns expressed by residents of Cheltenham and Beecoft, such as the inappropriateness of a metro style project for the North West Rail Link from Rouse Hill To Chatswood, but some of their arguments are completely untrue. For example, they have consistently claimed that it will be necessary to change trains twice to complete a journey to the city, but they have conveniently ignored the fact, confirmed by the Government innumerable times, that an alternative service will be available to the city via Strathfield, in effect reverting to the long standing operating pattern prior to the opening of the Epping to Chatswood Rail Link, without the need to change trains. With regard to the Epping to Thornleigh Third Track project as part of the Northern Sydney Freight Corridor Program, whilst I acknowledge that wheel squeal, particularly between Cheltenham and Pennant Hills, is a problem, it won’t have any dramatic impact throughout the late night/early morning period because the Third Rail project is essentially designed to allow more freight services during the morning and afternoon peak periods, which are currently banned. The wheel squeal problem is a separate issue, which can be addressed by more stringent standards being imposed on freight operators. Other spurious arguments have been raised against to the Third Rail project such as the claim that road freight would be a more efficient means of catering for increased freight movement than by an enhanced rail freight network. How can you possibly believe that? We will have to change trains at the WORST place possible, Epping station with steep banks of escalators and then again at Central as Epping trains will terminate there, there has not been a definite promise that the Epping trains will go through to Wynyard etc without a change. Most Northern Line people work/study/visit in/at Mac Uni, Mac Park, North Ryde, Chatswood or North Sydney so they WILL have to change TWICE each way. As I said, I am not against moving freight by rail but the noise is deafening and seriously physically painful for locals. See http://www.youtube.com/watch?v=ju944hXVdiM and educate yourself. Joni, who cares? Beecroft residents who bought there should have known that freight travelled the line, and has I would presume since the 19th century. Why are they complaining about them now? Sounds pretty NIMBYish to me. The solution would be to straighten out the line so it has broader curves requiring resumptions and you can bet your bottom dollar that the NIMBYs will scream at that. What’s so bad about changing at Epping? At least you have escalators. You should try changing at Granville, Lidcombe or Hornsby. Ray, one point, you can’t revert to previous operating patterns for the Northern Line because a number of Western Line trains now run through to Town Hall. You’d need to radically increase Western Line termination at Sydney Terminal to achieve that. I don’t really see that as a reasonable option. Better to have the less busy upper northern line trains run into Sydney Terminal. Thanks Simon for your support. The wheel squeal on the tight curves between Cheltenham and Pennant Hills, as you alluded to, has been a problem since the line opened in 1886 and I agree that it’s a bit late to start complaining now. I suggest it is only a significant problem in the late night hours when people are sleeping and when few freight trains run anyway. The Epping to Thornleigh Third Track project will not dramatically increase freight train movements during those hours as the current infrastructure can more than adequately cope with the current or potential number of train movements. The main focus of the infrastructure upgrade, and this is the first stage, is to allow freight movements during the morning and afternoon peak hours which are currently subject to a curfew. This is the preferred timeframe for freight forwarders wishing to have next morning deliveries to and from Brisbane. I don’t think that the noise problem would be such an issue during that time of day. I lived for over 20 years directly under the Sydney Airport flight path at Drummoyne, and yes at times the noise level was annoying, but I learned to live with it and quite frankly most of the time the noise impact didn’t even register. I now live within 400m of the Northern Line and I do hear train movements throughout the night, but it doesn’t bother me. Everyone has a choice of where they want to live. I’m not an expert and I don’t claim to have a solution to the wheel squeal problem, but from my reading of other blogs, this is not an insurmountable issue. With regard to the matter of a direct train service from the upper Northern Line to the city (Hornsby to Epping), let me make it one thing clear, there will not be a need to change trains. If you want to travel via the North Shore Line, yes, you will have to change trains twice, at Epping and Chatswood. However, an alternative service will be available direct to the city via Strathfield without the need to change trains. This is reverting to the previous longstanding operating pattern prior to the opening of the Epping to Chatswood Rail Link. The current Epping to CBD service via Strathfield already has train paths on the Western Suburban tracks through the CBD to the North Shore and there is no reason why they can’t be extended to incorporate the services from Hornsby to Epping. They could be supplemented in peak hours by services from Epping to Central, travelling on the Main Line tracks from Strathfield, effectively doubling the number of peak hour services from 4 to 8 tph on one of the most overcrowded sectors of the CityRail network. This is exactly what has been proposed in the recently leaked draft timetable. Simon, obviously affected people do care and have the right to discuss this. Of course people living in Beecroft and Cheltenham know about the rail noise but it is worse now than years ago and also that’s like saying the people in the North West knew there was no train line there when they bought their homes and shouldn’t expect one now. They could have bought on a train line eg at Thornleigh for the same price. The wheel squeal noise is worse during the day time as you walk around the area it is impossible to hear anything and the noise is painfully shrill. It was not as bad as that when we bought here in 1998. I put up with it and as I have said 3 times I am not against the 3rd freight line. The change at Epping has escalators as the line is deep underground and these escalators are extra long and steep, hard to negotiate when you are frail, elderly or have children. Ray – You may live 400 m from the Northern Line but you obviously don’t live in Beecroft or Cheltenham. It;s the incline and curves on the track here that make the wheel squeal painfully loud, where you live may be a straight part of the line, so no comparison. Re: “the noise is worse now than in the past”. Is there any data to support this assertion? Not impossible, I suppose, if the standards the line is maintained to have changed, but it doesn’t seem likely. I will ask about the data. We’ve been here for years and the squeal is worse in the last few years mainly between Cheltenham and Pennant Hills. And unlike airport noise, where Ray made the comparison, there is no curfew on freight line noise. What’s hard to negotiate about escalators? You get on and off. For those that can’t do so, there are elevators. Where’s the problem!! Continuing to argue this point just erodes your credibility. Regarding the NW people, I absolutely have no sympathy for them. The NWRL makes little sense as a transport plan, particularly in the guise currently planned but the previous one was only slightly better. If they expected to see a train, then they gambled that they would even though it didn’t fit into the Sydney system. It looks like they are going to win, even though they don’t deserve it. Regarding the double change, there will also be a single change option via Hornsby, which will make sense for some people e.g. Normanhurst to North Sydney. Although I doubt the single seat option will still be present in peak hour at least. Simon, the Epping escalators are banks of exceptionally steep and long escalators and elderly people have found them to make them dizzy, myself included. They also are hard to manage if you have several young children as I do. I’d like you to watch this video http://www.youtube.com/watch?v=BlCNBlE8TWs and you will perhaps understand. The escalators descend into one of Sydney’s steepest railway tunnel,To have to change trains via banks of these every time is a horrible prospect. We keep losing amenity and there is no WIN – WIN for us, where there should be. “Continuing to argue this point just erodes your credibility.” I have to keep explaining the point to you, Simon– because you seem to not be familiar with the extent of the problem since you are not local. I suspect that the NW people won’t realise the folly of the current plan until it is up and running and then it will be too late to change anything. I also predict that because of the difficulty of getting on a train at Chatswood to complete their journey to the city, many will opt to change at Epping instead to Northern Line services to the city via Strathfield. This will place additional pressure on the Northern Line to cope with the increased patronage. The potential interchange problems at Chatswood have been grossly underestimated and the government has attempted to gloss over the extent of this disaster with just more spin. I agree. It’s all being pushed through with community “consultation” but the concerns raised during consultation have been glossed over and ignored. Joni, you’re not listening. You won’t have to change trains at Epping to complete a journey to the city. You can catch a train between Hornsby and Epping direct to the city via Strathfield without the need to change trains. Why do you continue to ignore this fact? I suggest that the great majority of commuters would be travelling direct to the city and not Macquarie Park and the North Shore, which would require a change of trains at Epping. Ray, a main NWRL representative late last year confirmed that Northern Line commuters WILL have to change trains at Epping and then again at Chatswood.Do you have new info for us? If so, could you pass on the data so I can show all the local Trusts here and around the NW region please? The majority of people on the station that I use go to Mac Uni, Mac Park, North Ryde, Chatswood, North Sydney. Do you have data to show otherwise please?? I give up. I understand plenty. Once a NIMBY, always a NIMBY. Did you watch the videos, Simon? It’s easy to label people but harder to discuss things maturely and try to see another’s point of view. Joni, again you ignore the published facts. Do I have to spell It out to you? YOU WILL NOT HAVE TO CHANGE TRAINS TO COMPLETE A JOURNEY TO THE CITY. An alternative service will be available via Strathfield without the need to change trains. If your preference is to travel to the city via the ECRL and North Shore Line, then that is your choice and you will have to change trains twice, but why would you do that when you can complete the journey via Strathfield without changing trains and when the time difference is actually faster. I suggest you read the Submissions Report Responses on the Department of Planning & Infrastructure website which confirms innumerable times that a direct service to the city via Strathfield will be available without the need to change trains. I don’t have specific data to show the number of commuters from the Upper Northern Line travelling to Macquarie Park/North Shore destinations, but anecdotal evidence would suggest that the Sydney CBD is overwhelmingly the biggest concentration of employment, dwarfing that at Macquarie Park/North Shore. It is most likely that commuters from the Upper Northern Line to at least Macquarie Park would travel by car. It is unlikely that the majority of commuters from the Upper Northern Line would be destined for Macquarie Park/North Shore rather than the CBD. Ray -The NWRL people need to be better informed as they confirmed to me personally that we’d need to change trains to get anywhere past Cheltenham. Newspaper and media have run stories backing this up. Plus the other info is that the Strathfield line route will terminate at Central necessitating a change of trains to get into Town Hall or Wynyard. I’m happy to be corrected if I am wrong but this is what we have heard. Well Joni, did you go (or have you ever been) to Granville, Lidcombe or Hornsby stations? I think not. You could also add Redfern or Strathfield now that I think about it a bit more. You haven’t given me any reason to take you seriously. I’ve been to Epping, as well as all the other places I’ve listed. I don’t see what’s so bad about it. Town Hall is more annoying when heading to Wynyard, what with trains on multiple decks. Hi Simon, yes to Granville, Lidcombe, Hornsby, Redfern and Strathfield numerous times as I have used trains continuously since I was 6 years old. I thought you were “giving up”?? Why are you so upset if someone has a personal opinion that varies from yours? Obviously a brain fade on my part wrt giving up. Joni, there is a lot of misinformation floating around about the operation of the Northern Line after the NWRL opens. As I pointed out earlier, Transport for NSW’s response to this in its Submissions Report to the Department of Planning & Infrastructure was that an alternative service for Upper Northern Line commuters will be available to the city via Strathfield. There’s no mention of the need to change trains. A half page Project Update for the NWRL in the Northern District Times on the 5th June (page 19) also confirmed this. Under the heading Northern Line services, it says – “Once the North West Rail Link is operating, customers in the Beecroft and Pennant Hills areas will be able to travel to the city on the main Northern Line. Customers from the Beecroft and Pennant Hills areas who want to travel to Chatswood and beyond will change trains at Epping”. That sounds pretty clear to me. As for the suggestion that all Northern Line services via Strathfield will terminate at Central, this is pure speculation. To put this into perspective, there are no plans that I am aware of to change the current Epping to the city service via Strathfield through to the North Shore. The recently leaked draft timetable continues to maintain this service and it is unlikely to change with the opening of the NWRL. It would seem perfectly logical to extend this service to and from Hornsby as a single combined service, reverting to what it was before the opening of the ECRL. No need to change trains. The only downside may be that additional peak hour services from Epping to the city via Strathfield may have to terminate at Central, which has been proposed in the draft timetable. However, I don’t think this is as bad as it seems. All Northern Line stations from Hornsby to North Strathfield would still have direct access through the CBD to the North Shore, without changing trains, and additional peak hour services from Epping to Central could potentially double the service on this sector. Ray, do you have a link regarding the upper northern line? Info I’ve seen out of T4NSW inferred that the upper northern line would run into Sydney Terminal at least in peak hour. What are you looking at? You might say this is speculation, but it’s well informed speculation. What western line services will be cut to fit upper northern line trains into Central #16? Or will they bring back Macdonaldtown conflicts? Only other option would be more trains via Strathfield #7 & #8 – a suggestion which has been officially floated but cannot be taken particularly seriously. Simon, there is a schematic diagram in the Transport for NSW submission that shows services from Hornsby via Strathfield terminating at Central, but it also shows the existing service from Epping continuing through the CBD to the North Shore. This doesn’t necessarily mean that this operating pattern is set in concrete, because by the time a new timetable is introduced circumstances can change. I can’t find anything in print that actually says that all Northern Line services will terminate at Central. It seems only common sense that these currently separate services should be combined to operate as a single service taking over the existing train paths on the “Suburban” tracks from Strathfield to the CBD and reverting to the operating pattern that existed prior to the opening of the ECRL. Every Northern Line station would then have a direct service through the CBD. I’m not suggesting that any additional train paths would be needed on the “Suburban” tracks through Platforms 16 & 18 at Central. In this scenario, additional services from Epping via Strathfield, which would only operate in peak hours, would have to travel via the “Main” tracks from Strathfield to Central Terminal, which is what has been proposed in the draft timetable for the morning peak. If you can see any problems with this, I’d welcome your comments. Be really nice if I had a link so I could actually see the schematic you are referring to. That said, I think the most reasonable operating pattern for peak hour *by far* is upper northern line into Central (i), lower northern line to Town Hall. Otherwise you will have more people needing to transfer than you should. The problem with reverting to old patterns is that Western Line trains have taken their paths through Town Hall. In some cases this is because a number of Western Line trains were running into Central (i) before, in others it is new trains to allow for growth. Central 16 is basically completely full up in the AM peak – no room for increased trains (well, I think there is at least one 4 minute gap rather than 3 minute, perhaps two). Simon, my response to your query has mysteriously disappeared (Bambul, what is going on?). The link to the schematic diagram in question is shown below (Page 25 – Figure 5.1 Rail Service Strategy). However, I beg to differ with regard to your suggestion for the operating pattern for the Northern Line, post opening of the NWRL. In my opinion, it is a simple matter of swapping the train paths for the services originating from Hornsby and Epping to the CBD between Strathfield to Central during peak hours so that all Northern Line Stations from Hornsby would have a direct service through the CBD to the North Shore. Commuters/passengers/customers (forgive me, but I couldn’t resist it) from Epping during peak hours would have the option of choosing between a service through the CBD or a terminating service at Central. After all, a significant number of commuters only travel as far as Central anyway. The number of commuters interchanging would be minimal. The current Newcastle/Central Coast Intercity services from Epping and Eastwood to Central are already well patronised, although admittedly they are express services. There is no need for any additional train paths between Strathfield and Central. I haven’t deleted any comments. Had a quick look at the spam folder, and there’s nothing there from you (some comments get held as spam if they have more than 1 or 2 links in them). Could it have been a comment made to another post? There’s quite a few posts with active comments sections at the moment. Ray, that link you provide agrees with what I am saying. It states via North Strathfield will see 4tph from Epping, 4tph from Hornsby and 4tph from the Central Coast for 12tph total, as against the current of 8tph. Both the from Hornsby and from Central Coast is to terminate at Sydney Terminal. Perhaps there is some miscommunication? Thanks Bambul, I don’t know what happened, but my comments definitely appeared on the site after I posted them. It may have something to do with the fact that I posted them directly from my email address. However, not to worry, my subsequent post is more up to date. Simon, perhaps I did not express myself clearly enough, but you are correct that there are a total of 12tph proposed from the Northern Line against the current 8tph. The additional 4tph would run via the “Main Line” tracks between Strathfield and Central Terminal where there is obviously spare capacity. It would even be more so if some of the Western Line services crossed to the “Suburban Line” tracks at Homebush instead of Eveleigh. There are no spare paths on the “Suburban Line” tracks through Platform 16 at Central and I wasn’t suggesting that to be the case. What I’m suggesting is that it would be a simple matter of swapping the train paths/tracks for services originating from Hornsby and Epping between Strathfield and Central during peak hours so that all Northern Line stations would have a through service to the North Shore (Platform 16 Central/Wynyard) without the need to change trains. Ok Ray, sounds like what you are saying is that the busier Western Line services should suffer the inconvenience of running into Sydney Terminal rather than less busy upper Northern Line trains. Simon, I’m saying the exact opposite. I haven’t suggested that Western Line trains surrender any of their train paths on the “Suburban Line” tracks for the benefit of Northern Line services. The Northern Line already has 4tph on the “Suburban Line” tracks. The Western Line has up to 16tph shared between the “Main Line” and “Suburban Line” tracks from Homebush which merge to the “Suburban Line” tracks at Eveleigh. This brings it up to its maximum capacity of 20tph through Platform 16 at Central including the existing 4tph from the Northern Line. That wouldn’t change. The “Main Line” tracks from Strathfield to Central have spare capacity and this is what the additional 4tph from the Northern Line would utilise (4 Northern Local + 4 Intercity), all terminating at Central. This is confirmed in the schematic diagram prepared by TfNSW mentioned earlier. If you have any evidence to the contrary, then I’d welcome your comments. Hmm, are you referring to Western Line trains passing Granville platform #3 in the AM peak? If so, this is the exception rather than the rule. Checking the draft timetable shows it only is planned to happen once every 15 minutes in the AM peak. Perhaps that is once too many, but that would really require a common stopping pattern between Parramatta and Redfern because 16tph Western + 4tph Mountains has a single track pair at capacity. We’re getting a bit off topic for this post, but I’m referring to the Western Line (Main + Suburban) from Homebush to Eveleigh. As you will see from the schematic diagram, there are a total of 16tph immediately before the Homebush crossovers shared between the 2 track pairs (excluding Intercity services). Some suburban trains cross over from the “Main” to the “Suburban” tracks at this point (I don’t know what the exact split is) and the balance travel via the “Main” through to Eveleigh, where they also cross over, bringing the “Suburban” tracks up to their maximum capacity of 20tph, which includes the existing 4tph from the Northern Line. Makes that 8tph – more than I thought actually. I thought they were getting rid of these sorts of moves! All other trains from Central #18 follow the sensible path of utilising the crossovers at Homebush or heading for Epping. I don’t understand what point you’re trying to make Simon. Bearing in mind that the schematic diagram previously raised is the proposed operating pattern post opening of the NWRL, it does not necessarily translate to being the same as the current timetable or even the leaked draft timetable to take effect in October this year. Things could change. However, putting that aside, when you compare it with the draft timetable, the level of services on the Western Line would appear to be unchanged from what is proposed, ie, a total of 16tph through Central #16. If you count the number of Western Line services departing Central #16 strictly within the 8.00am to 9.00am timeframe, then there are 16tph in the draft timetable (you overlooked the 8.57 departure from Central originating from the Penrith turnback). There are only 3 services during this period through Granville #1 crossing at Homebush to Strathfield #4 and Central #16. The rest continue on the “Main” tracks to cross over at Eveleigh/Macdonaldtown. Then you have to add to this the 4tph from the Northern Line through Strathfield #5 (from Epping), departing Central #16 at 8.09, 8.24, 8.39 and 8.54, bringing it up to its total capacity of 20tph. All of the services originating on the “Main” Western Line tracks, including those that cross over to the “Suburban” tracks at Homebush, skip Burwood, but there is no reason why all of the existing “Main” track services could not cross over at Homebush instead of Eveleigh if the stop at Burwood was reinstated. This would free up paths on the “Main” tracks from Strathfield to Central Terminal for additional Western and Northern Line services (where they would obviously terminate), including Intercity services from the Blue Mountains and Newcastle/Central Coast. Ideally, the “Main” tracks should connect from Eveleigh to a future CBD Rail Link and 2nd Harbour Crossing, which now seems unlikely because of the Rapid Transit proposal, but that’s another story. Whichever way you look at it, it all boils down to the fact that 16tph from the Western Line 2 track pair (Main + Suburban) eventually merge by Eveleigh to the “Suburban” tracks through Central #16. I was about to argue that there aren’t very many trains crossing at Eveleigh any more but assuming the draft timetable is adopted that won’t be a fact. BTW, the 8:57 train also crosses at Homebush so that makes 4 doing so. I’d already had 1hr worth of those trains but I guess it would have been nice to add the 8:57am train. I’d done so much work I thought I’d post it anyway. I doubt we will see Burwood added for so many trains. But perhaps half of the Eveleigh crossing trains could become Homebush crossing. But the trains running from Strathfield #6 to Lidcombe/Granville #4 have to go. That’s I guess my main point out of the above. Next on my hit list is Sydney Terminal departures in the AM peak. How can this be for real? Surely a shorter tunnel from Cheltenham to Cherrybrook isn’t as costly as a longer tunnel to Epping, and with a long stretch without stations. This was all about NIMBY politics, pure and simple. The leafy northerners shrieked about a loss of serenity, when nobody’s “Castle” was under threat. This is a betrayal. I don’t think so. The locals don’t have much power at all, being a very, very safe seat and a tiny population.